The Yemeni crisis is entering a new phase. A conglomeration of forces ostensibly linked to exiled President Abdorabbo Mansour Hadi has, for now, pushed the Houthi rebels and their allies out of the South. Aided by Saudi airpower and Emirati armored divisions, anti-Houthi cadres are consolidating territory in central Yemen. These forces have announced plans to soon move on Yemen’s capital, Sana’a. Hadi’s exiled government is already making plans for Yemen’s future, with the ousted Yemeni president affirming his intention to impose a federalist model “whether it is wanted or refused.” Perhaps the most significant outcome of the National Dialogue Conference (NDC) was an understanding that decentralizing Yemen is the only sensible way of maintaining Yemen’s broader unity. However, Hadi’s tough talk is unproductive. The implementation of decentralization processes requires local support and is often vulnerable to security crises and exploitation by corrupt political actors. Furthermore, such efforts require a confidence in the central government that Hadi fails to inspire. Hadi’s government has been supported fervently by the Saudis and other Gulf Cooperation Council (GCC) members and quietly by Western powers. His lack of popularity within Yemen, however, is deeply problematic. The Saudi-led international coalition arrayed behind Hadi is unlikely to relinquish its insistence on his leadership. While Hadi’s leadership lacks longevity as long as it fails to garner meaningful support on the ground, his initial test of competence will revolve around accessing humanitarian aid that can be distributed robustly and without political conditions or regional favoritism. Whatever political processes Hadi seeks to pursue, the public will remain uninterested in his ideas as long as ten million children remain in dire need of assistance, and famine looms on the horizon. Yet Hadi’s government does not have the resources to meet these needs. Furthermore, aid efforts alone will require an enormous amount of support from the international community that created and sustained the exiled president’s war effort. Therefore, the reconstruction of Yemen will require a concomitant herculean effort. The closest attainable grand bargain to satisfy all of these disparate and aggrieved factions is the already existent outcomes of the NDC, yet championing the NDC alone will not build faith in Hadi. Instead, the government-in-exile should focus on attaining new micro-agreements based on local constituencies, while building the functional power-sharing bodies that can cultivate confidence in its national and subnational efforts. Territorial and political autonomy is necessary for securing participation in the many areas where trust in the central government is at an all-time low. Loyalty to Hadi remains a farfetched objective. Yet his government is in a position to secure allegiances—however fragile—as a practical interlocutor based on rational self-interest. Saudi Arabia’s bombardment and the Houthis’ shelling have only resulted in widespread devastation to the war-torn country’s infrastructure. Using reconstruction as a carrot for broader participation in Yemen’s renewal—an incentive not without controversy—is infinitely more productive than the authoritarian language employed to cow political skeptics. Hadi’s tough talk is only threatening if the leader is given more credit than he is due. Based on his perception across Yemen’s political spectrum, however, his talk remains merely unbelievable and serves only to undermine the vital project that the exiled president seeks to undertake. The gravest challenge facing Hadi’s government will be to fill the security vacuums that are emerging amidst the conflict while at the same time building the federal structure. Although al-Qaeda in the Arabian Peninsula (AQAP) has agreed to leave Mukalla, it will likely take away money and arms pilfered from the city’s banks and military bases. Alongside reports of AQAP fighters buttressing the popular committees, thus forcing the Houthis to retreat, other reports indicate that the terrorist group is digging into neighborhoods in Aden—despite the government’s partial denial. Beyond AQAP, numerous armed groups have emerged, including the Southern Herak, a formerly non-violent group pushed by the ongoing conflict to take up arms. As Yemen’s military is split between Saleh and Hadi loyalists, local insecurity threatens to further balkanize the country. Demobilization of subnational armed groups and militias requires a sense of security among the population. Attempts to forcibly disarm such groups are neither prudent nor possible; thus the government should focus on building and professionalizing community-based security forces that emphasize transparency and consultation. Given the low probability of Yemen achieving any semblance of stability in the near-term, is it critical for such initiatives to be pursued at the local level as the opportunities become available. Though the enormity of Yemen’s turmoil leaves the country at a considerable deficit moving forward, in many ways sectors of the country long beholden to corruption and clientelism now have a clean slate—if not a vacuum—on which to build. Hadi is not the ideal leader to pursue the delicate path of decentralization and federalism, but without serious amendments to the political calculus of his GCC and Western allies that in turn support his exiled government, Hadi’s leadership role remains an unfortunate fact, the pitfalls of which must be mollified as much as possible. 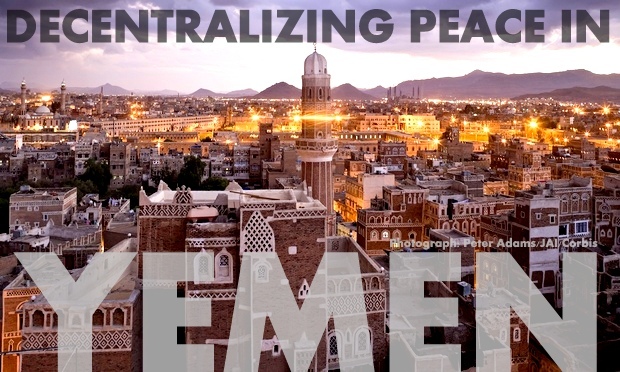 The risks of decentralization are high, yet given the alternative of continued internecine conflict and humanitarian disaster, Yemen’s unity remains a critical component of stability and renewal. Adam Simpson is the Project Assistant for the Middle East Strategy Task Force, an initiative of the Atlantic Council’s Rafik Hariri Center for the Middle East.